This one’s for Ninja Barb. Ninja Barb is my seventy-frbrngtn year old neighbor. And my dear friend. If you’d asked me who in the neighborhood I’d become closest to when we bought our house all those years ago, I would never had imagined what a spark she and I could have made together! She tells me I have an old soul and I tell her she just drinks too much and shouldn't listen to me ‘cause what do I know. I think she and I relate because we’re both from the country (like country country). And living in the ‘burbs like we do now, finding someone who knows about black-water creeks and slop jars and scuppernongs and dirt roads is a rare thing. And it makes home feel a little more like home. NB’s been hinting to me about this cake for a while now. So I thought I’d make her one this weekend. I’d never made one so I looked at tons of recipes (most of which she’d stapled to my forehead over the last three weeks). There were variances here and there and after enough research, I scratched out a recipe and gave it a shot. Looking at the glaze recipes I saw, I could tell I was going to have a boatload of it. So instead of reducing it, I thought I'd leave out the customary buttermilk in the cake, finishing the cake off with a little less liquid and then use the glaze to make a poke cake. And it was gooood! Ninja Barb said so. Preheat oven to 350 degrees. Grease and flour a 13x9 baking pan; set aside. Sift together flour, baking soda, salt and cocoa powder; set aside. Using an electric mixer at medium speed, beat together butter, oil, sugar, vanilla and eggs until creamy (about 2 minutes). Add Coca-Cola and mix on low speed. With mixer still set at low, add flour mixture and continue mixing for one minute or until all ingredients are thoroughly combined. Pour batter into prepared pan. Bake at 350 degrees for 30-40 minutes or until toothpick inserted in the middle comes out clean. Once done, poke holes in the cake at about 1-inch intervals using a serving fork, skewer or whatever gets it done (try not to use a regular fork if the tines are pretty close together because it might tear up the cake too much); set aside and make the glaze. Sift together powdered sugar and cocoa powder*; set aside. In a medium-sized saucepan heat butter and Coca-Cola over medium-high heat until boiling. Once mixture starts to boil, continue cooking for one minute. Remove pan from heat and whisk in sugar and cocoa mixture until smooth. Slowly pour glaze over cake. If your cake isn't completely level (and mine wasn't), using potholders to handle the pan, slowly tilt cake back and forth, forward and back until all the glaze has soaked into the cake. This prevents all the glaze from settling into the low spots. Cool at room temperature for 1-2 hours before serving. *you don't have to but you see that little glump in the glaze near the edge of the cake directly under the hyphen and capital C in "cola"? That's from me not sifting my powdered sugar. This is the best chocolate cake ever! I make this often with my 5 yr old granddaughter! She says it is the bestest cake and would eat it at every meal if allowed! I too get the occasional powdered sugar lump, but it does not take away from the chocolate, moist, gooey cake! Thanks for sharing! You know I am making this!! 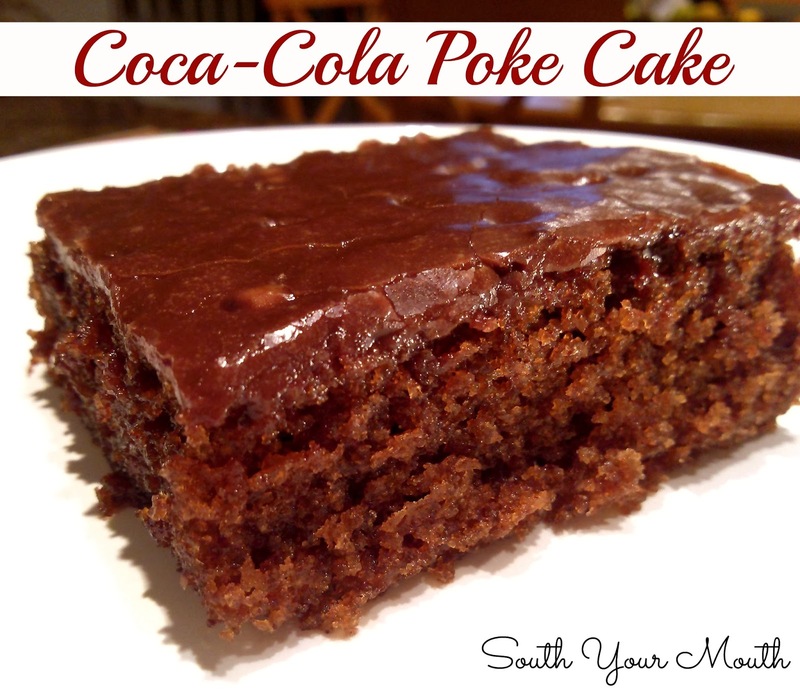 We country girls just called it cocola cake! Good stuff! how is would putting a layer of peanut butter between the cake and frosting be? Can I make this a day ahead of time? If so, do I need to store in the fridge or leave it out? Sure! And I leave this at room temperature (no need to refrigerate).